Sometimes you just know what you want and have to have it now! Maybe you love the shopping ritual, feeling the fabric, looking at the quality….sounds like shopping for a pair of jeans huh? Well, in fact you can do this for slings too!! Admittedly the ranges carried in shops are nothing like the massive range you can find online, but it still gives you a pretty good idea and still satisfies that retail therapy craving! Of course, being able to actually shop for a sling is a lot easier if you are in a rush or need a sling for a specific occasion or emergency too. Shops do tend to have smaller ranges and are, in most cases, sold by staff who have no training in the fitting and safety of the slings they sell. If you think you might need help using the sling or you have any special circumstances or medical conditions that might affect your sling use, it is worth bearing in mind that the staff may not be best equipped to advise you. You are more than welcome to bring a sling you already own to a sling library or to a sling consultant for help in using it. Some sling libraries and consultants also sell a small selection of slings themselves. 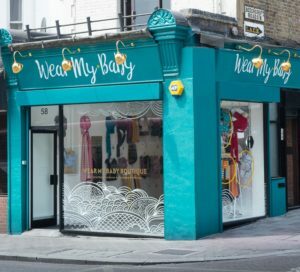 We have compiled a list of shops in London that sell slings as well as whether the staff are trained (by trained, we mean that they have undertaken a sling consultancy or peer support course) and also the types of sling they sell. We plan to visit all of the shops on this list in the future to check which slings are stocked, and to assess the level of information their sales assistants are able to provide about the slings they stock – once we’ve done this, the shop will be Slinging London CIC Verified. Do you have a shop in Greater London that stocks ergonomic slings? Are you already listed and would like changes to be made to your listing? Just contact us and we will be happy to add or amend your listing.